Matt Miller has been working at the Rocky River store for over 10 years, but don't feel bad if you don't know him, because he can only be found there on Sundays. During the week, he works as a marketing manager for a large local company, but fills in part-time for us in order to indulge his passion for cycling. He has actually been around the store even longer, as he worked at the previous bike shop located in the building before it was acquired by Century Cycles. So, he kind of "came with" the business! 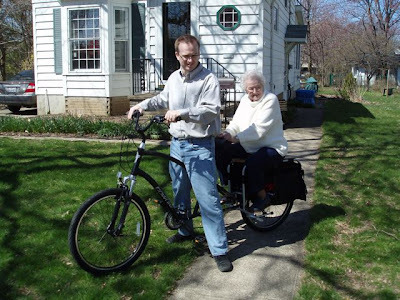 He says, "I love the people I work with and being able to help customers enjoy something as simple as riding a bike." The reason behind the bike is, as he explains, "My wife and I want to use our bikes for some of the errands we could actually ride to. 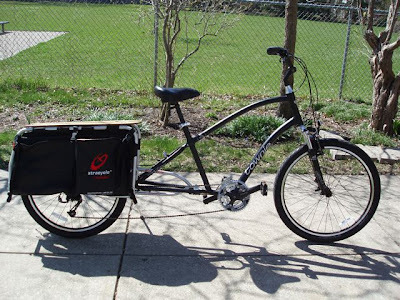 This allows us to pull the Burley trailer and carry groceries, kids and anything else we could need." 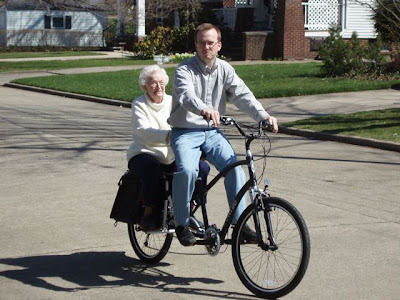 The bike can also handle passengers, and Matt convinced his 85-year-old grandmother to be the first to test it out! He says, "Grandma did like the ride. She was a little nervous and was pretty sure we were just going to tip over 'because we were only on two wheels!' But she enjoyed the ride and laughed about it afterwards. I think the seat was a little hard since it's only a piece of wood." 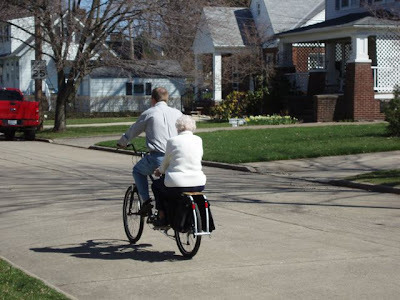 And yes, before you start writing letters, Matt usually does ride with a helmet!